Aiding in the empowerment of the people of God, helping them to fulfill their mission of love, justice, and peace in the community. 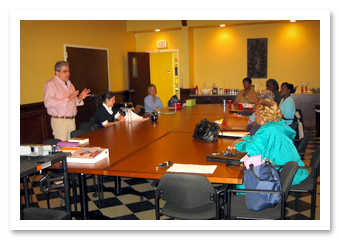 The Catholic Charities office of Parish Social Ministry strives to assist parishioners, through the parish community, to understand and act on Catholic Social Teaching. The common thread that weaves all this together is regular formation, education and reflection on Catholic Social Teaching. The Parish Social Ministry office believes this to be an essential element of living out the faith in Jesus Christ. It strives to assist in promoting education about Catholic Social Teaching and training leaders in the skills of effective parish social ministry. Parish Social Ministry: committed to nurturing, fostering, and supporting Catholic parish leaders who do direct service, advocacy, community organizing, and justice education activities. Parish Social Ministry aids in the empowerment of the people of God, helping them to fulfill their mission of love, justice and peace in the community. To help achieve these goals, Parish Social Ministry continues to develop comprehensive workshops based on Catholic Social Teaching. Parish Social Ministry Certification helps provide members of the Diocese of Beaumont parishes with the skills and knowledge required to serve Christ by serving others. The Catholic Campaign for Human Development (CCHD) was established in 1969 to empower groups of poor and low-income people to address the root causes of poverty in their communities. For the past forty-nine years, CCHD has worked to help people break the cycle of poverty, not just for a day, but for a lifetime. Through the generosity of parishioners, CCHD is able to help fund projects within the Diocese of Beaumont and throughout the United States, without regard to religious affiliation, which encourage self-sufficiency, education, and training. Non-profit 501(c)(3) organizations working to address social issues in the community are welcome to apply for these CCHD grants. Viewing the parish community as inclusive of its entire geographical area, Catholic Charities, through the Parish Social Ministry office, administers the local grant funding process made available through these CCHD monies. For additional information, please contact Coquese Williams at 409-924-4415. The Catholic Charities office of Parish Social Ministry sponsors an annual Third Age Day Celebration. Hosted by a parish selected by the Third Age Task Force members, this diocesan wide event provides an opportunity for parishioners age 50 and over to come together for worship, fellowship, entertainment and lunch. Click here to link to the Washington Weekly page of the Catholic Charities USA website for discussion of social policy matters. Click here to view, print, or email a copy of Parish Social Ministry program brochure.